The definitive guide to birding around Phoenix, by Janet Witzeman, Troy Corman, Tommy Debardeleben and Laurie Nessel. The first edition was published in 1972 by Janet Witzeman, Elanor Radke and Bix Demaree and revised in 1997. 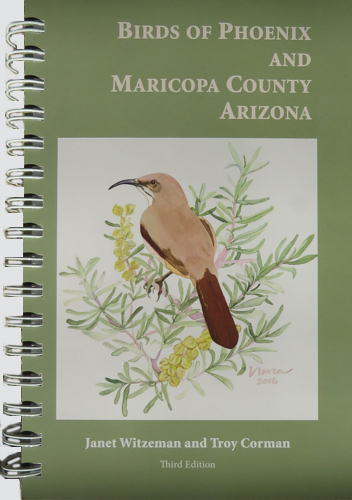 Proceeds from the sale of this publication go to support the Maricopa Audubon Society. This guide is for visitors and residents alike. The species accounts and bar graphs aid birders in determining status, abundance, seasonal occurrence, and habitat preference for 459 species that have been recorded in the County. Descriptions and maps direct birders to 82 birding spots in and around Phoenix as well as to far-reaching areas of the county. A 17-page chapter on habitats found in the county includes full-color photographs and two maps depicting elevation and habitat. A chapter discusses changes in the status of birds and their habitats in the county since the second edition. Twenty-seven color photos document some of the 33 birds new to the county since 1997. 228 pages, spiralbound 5-13/4" X 8-1/2" fieldguide format. 82 full color photos, 93 graphs, 10 maps. The book is sold at a 10% discount for $25.00 (cash, credit card, or check made out to: Maricopa Audubon Society) for current members of the Maricopa Audubon Society chapter and only at the Maricopa Audubon Society Members meetings. Meetings are the second Tuesday of the month September through April from 7pm to 9pm. Doors open at 6:30pm.